I’m sure we’ve all day dreamed at some point about the ideal tying space. I had an office desk for many years with hanging file folder drawers; I really like that for organization but it’s not the most beautiful arrangement. Lately I’ve been reconfiguring a formal dining room I never used into a better looking office. I think the coolest thing would be to locate some antique library catalog cases, ideally the bigger ones for maps and the like. Have you guys seen any really cool tying spaces? I’m looking for ideas. Well I’m disappointed there’s no responses, but I’ll throw a few more pics up here anyway. Those were all just with the iphone, but that desk is going to be a great backdrop for fly photography, I can already tell. My cool tying space is a four legged plywood surface with a nice selection of offerings from the Container Store to stuff fly tying materials in to. It is far from being cool or unique other than the fact that it is a secluded, quiet spot in the basement where I can tie in peace while listening to the ballgame and “she” cannot keep count of my beer consumption. Zach, as far as finding that kind of furniture, it is just some old office piece from a drafting or architectural office. Your State DOT office building is being redone and if they are getting new office furniture I would expect you would be able to fine a couple of pieces, in wood, available at the State Surplus Property warehouse. Roy that is a hellacious tip. Thanks man. I was thinking the same thing about that desk being a cool backdrop. Hammonds has some similar storage drawers like those, just not antiques. Dont know how cool my tying space is but here it is anyway. It also serves me as a place where the beers are not counted. I love the neatly organized magazine collection AND the map of the Chattahoochee. I am a magazine hoarder for sure. 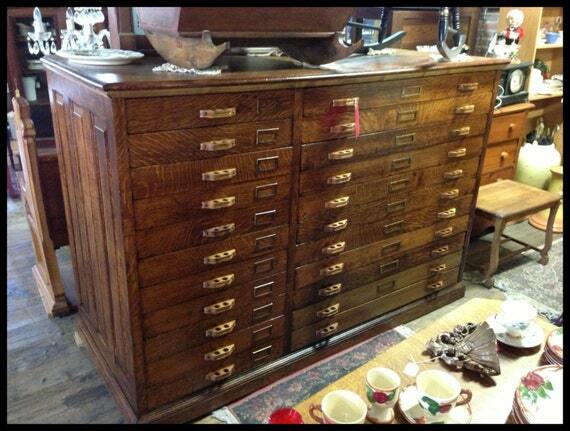 Love those map drawers. I have a few large-size drawers on a couple Gerstner boxes but I still find that plastic cases are best for some things like buck tails and a few other things. Easier for bulky items and sometimes it is nice to see what is in there without opening. So while I love wood drawers and would not hesitate to pick up a cool set of drawers like those (if the price was right), I doubt I would ever go all wood like I had imagined at one time. Also check out that big flea market in Atlanta. I hear it is good. My desk is walnut piece I bought from a flea market in CLT. It looked horrible after 50 or so years in a auto repair shop but it cleaned up nicely. This is my desk, kind of a “one of a kind” as the guy I bought off built it as a kid in the 70’s. Holds a ton of materials and closes up to hide the mess. I never close it as my “cave” is in the basement adjacent to the boiler. 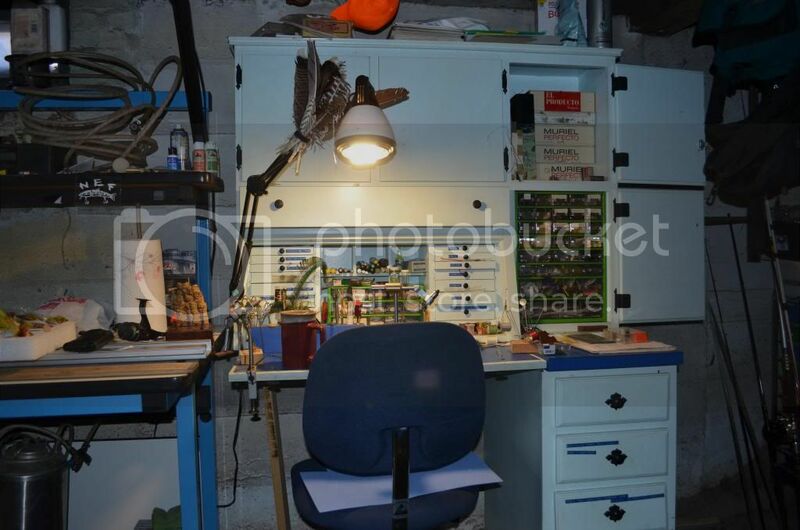 To the left is a desk on which my rod wrapping machine and accessories lives as well as reels, line and tools for repairing the same. It’s on older pic and has since been cleaned up, upgraded light etc. I want to redo the desk and make it more presentable but really don’t need to. Just not my favorite color. Those cabinets you’ve mentioned are expensive….but I’m sure they will hold their value. Think of them as an investment…ha…ha. If you are ever in Asheville….there are several antique stores on Swannanoa Road that have these on occasion. The Old Tobacco Barn antique store comes to mind. I have an old Gerstner as Aaron mentioned. I paid $200 for it on Ebay a few years ago. Other than the cabinet with the raised panel sides, this is pretty straight forward cabinet box making, with little more than a table saw needed. You could build one yourself or find a hobby woodworker to help you, or check with a local senior center ours is always looking for projects. Not sure which part tickled your funny bone, but I have built enough cabinets to see it that way. I guess it depends on exactly which “cabinet” you meant, and what you meant by “little more than a table saw”. If you are talking about a box with doors (all plywood) then ok I’d agree. Add drawers etc. the project gets a little more difficult without the proper tools. After 35+ years as a carpenter/cabinetmaker/furniture maker I just felt that it is very optimistic to think most people can or should take on a project like some of the above pics without some experience in trim and finish work first. After seeing some of the projects posted on this site I know a lot of the guys are well skilled and could do the basic stuff. I would suggest though that anyone whose livelihood requires them to have all ten fingers might consider buying a finished piece. I’d rather spend my time fishing or tying. I apologize for the bwaahaaa though, maybe I was thinking of some of my own experiences. Your right I may have overestimated some people’s skill abilities. I grew up in my uncles shop and spent the last 20 odd years building custom doors as a hobby,at some point walnut dust has become a pizza topping to me, and I would assume not many beginners have a wall full of clamps either. I think most cabinet saws offer that “hotdog” finger saver blade stop option now. I was looking at the one with the drawers open, mostly dados and rabbets, starting with some s4s lumber, no real complicated joinery, even wood drawer slides. Walnut for the showey parts maple or popular as the secondary, some plywood for the panels and tray bottoms. What’s your cost guesstimate on what it would take to run up the cabinet in the first picture? I would guess no less than $4000. Depending on exactly what kind of joinery is used in the drawers and carcass. Also its dimensions of course. That’s a beautiful piece and deserves the best efforts of a cabinetmaker. It would take almost as much time to sand and apply a finish as would the rest of the construction, or at least it seems because sanding is such drudgery. The material isn’t that bad but a skilled builder, with a shop and it’s overhead is expensive.